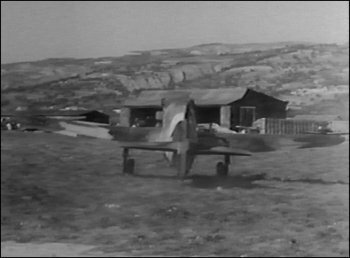 In February 1943, as a consequence of the dissolution of the Vichy Armee de l�Air, pilots of the Regia Aeronautica requisitioned aircraft from the Montelimar (Istres) airport in France, and in particular the Dewoitine D.520s which were transferred to Italy. This fighter was not very modern at the time of the transfer, however the aircraft was appreciated because of its 20 mm gun armament, needed against the US heavy bombers. The aircraft of concern in this article is no doubt one of the more interesting subjects of French aircraft in use by the Regia Aeronautica, as many images exist and is the object of several profiles. 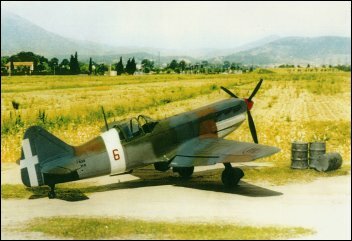 This plane carried the individual aircraft number 6 belonging to the 164th squadriglia, based at Reggio Calabria during the spring and summer of 1943. The first image I saw of this airplane was published in 1972 in Dimensione Cielo No.3 and the serial number was identified as NC510, which became its MM. 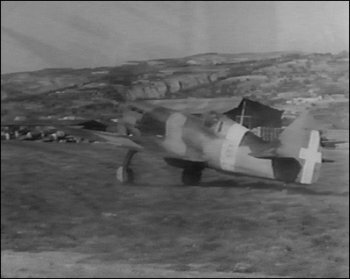 Subsequently this airplane was shown in four photos in the book �Regia Aeronautica e Armee de l�Air" by G. Garello; the first two photos were taken at Albenga, in Liguria, after the transfer from France; the other two photos probably at Reggio Calabria, in charge to the 164th squadriglia. The first detail of this aircraft upon which immediately one draws the attention is the lack of the white indentification bands on the wings, detail that is present on other captured D.520s.� To understand the insigna situation, research was performed and some very interesting information was reported in the French magazine �Le Fanatique de l�Aviation� (No. 141, August 1981), in the second part of a series of articles concerning camouflage and markings of French aircraft in the period 1935-1945. 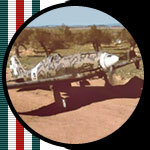 The part that more concerns the aircraft subsequently in charge to the Regia Aeronautica starts from June 1941. � The wing stripes (upper and lower) must have a width of 0.80m. � The application on the wings of tricolor bands 0.30m width, 30� inclined with respect to the airplane axis, that diverge from the axis in the rear part. Aircraft devoid of these markings were forbidden to fly from January 18th 1942; these measures, first limited to Tunisia, were extended to all areas of operations starting from February 6th 1942.� However, the most interesting disposition concerning our subject is the one following the Free French zone of occupation, as a consequence of the Allied landing in North Africa on November 7th 1942, when the Vichy French airforce ceased to exist.� Nevertheless the Axis partners were interested in recovering French aircraft, so such aircraft had to fly from French territory without risk of being mistaken for enemy aircraft.� The Circular coded 549C/CAT dated November 14th stated that �only those aircraft that have around the wings and the fuselage white bands 0.50m width and the lower part of the nose or of the engines in bright yellow are authorized to fly�.� This last detail is very interesting because its application is confirmed (even if is not immediately visible) by a color photo published in the magazine �Aerei nella Storia� No. 26, October-November 2002, page 29, and at last clarifies what the color should be; a light shade in the b/w photos available, which appears on several Regia Aeronautica D.520s, until now deemed a light gray or a similar color, used to obliterate the red and yellow Vichy bands. Considering again our aircraft of interest, the photos published in Garello�s book, which allows us to view the rear right side of the plane, highlights the absence of the white wing bands, when the plane is still at Albenga during the transfer phase. The CMPR archive images attached here, show the airplane already in charge to the 164th squadriglia and confirm the absence of the white wing bands, without showing any obliteration. � The wing bands have been cancelled before the transfer to Italy and the camouflage was restored to the French colors, or later in Italy with Italian colors. Concerning the other details, the first photo of the above cited Garello�s volume seemd to confirm the lower part of the nose in yellow and the red spinner in compliance with the directives.� Two other interesting considerations can be deduced from the images: in the first, the wing markings seem to be present on the left wing; it seems it doesn�t appear on the right wing: perhaps the image could have been taken during the insigna positioning phase or the lack of the presence could be due to the bad quality of the image; In the second image (above) it is possible to see the absence of the squadriglia number, 164 (in red on the fin in a 164th squadriglia C.202 color photo) in contrast with the well known image of the 164-1 that shows the squadriglia number on the fin.� In spite of all these details the airplane is considered a beautiful and interesting subject to model. Image 1 - rear view D.520 6, 164th Sq. which should be yellow, not GAC as previosuly thought.